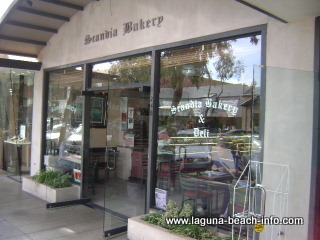 Scandia Bakery has an excellent selection of pastries in the downtown shops of Laguna Beach. If you're looking for a very casual coffee shop with great handmade pastries and baked goods, this is a great little shop that has been a local's favorite for years! You can enjoy your fresh sandwiches at a table and enjoy the people watching, or take a short walk down the block and enjoy the amazing views of Main Beach. Scandia Bakery is located in the historic shops of North Laguna Beach just a short walk to Main Beach!